HELLO BEAUTIFUL HOOPERS My Summer travels have brought me to Italy on a vacation with my family. Weaving in and out of piazzas, eating everything under the Tuscan sun... friends, I must admit that I have eaten gelato every single day for the past two weeks! The ONLY thing that is keeping me from blowing up like a balloon is my Travel Hoop. I break it out once or twice a day, and twirl to the sound of any music I can find; I love hoopin' to a good "squeeze box" (accordion); or the sound of church bells in the distance as I hoop it out in front of the pizzeria before dinner. Fortunately, I brought a second hoop along with me on my travels, and have been able to share the love with others who have never seen our style of hooping before. Ahhhhh.... che bella! And back at home... We're thrilled by the overwhelming support of our recent So You Think You Can Dance "National Dance Day" Facebook video challenge. Congratulations to Super-Hooper and Hooper of the Month Emily Belke for winning with over 130 votes on her fabulous Hoopnotica video. We are very inspired by Emily's talent and enthusiasm for Hoopnotica. Way to go, Emily! THANK YOU to everyone who participated, we enjoyed watching each and every one of your submissions. Watch Emily hoop it up below. Based on the success of the National Dance Day contest, we are excited to announce a new contest this month - "Where's the Hooper?" - and this time there will be FIVE prizes. Read all about it below- good luck! Arrivederci friends, and remember what HoopMamma says: Travel with your TravelHoop, and you can eat all the gelato you want! Stay tuned for my "End of Summer Slim Down" next month, just the same...! Happy Hooping! Gabriella Redding CEO & Hoopmamma THE SCOOP July brought tons of great press to the Hooping community! 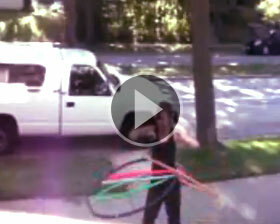 Shape Magazine featured a story on Marisa Tomei's new HoopBody Hoop and DVD. Congrats to Marisa - she learned from the best (us!). The New York Times featured Hoopnotica Certified Instructor Sheryl Wilson's Fitnotic Post-Natal Hoopnotica class in a story about fitness activities for new moms. If you are ever in the New York City area, be sure to drop in on one of Sheryl's classes! The Mayo Clinic released a story on the health benefits of hooping. AOL's "Thats Fit" blog featured a write up on the Hoopnotica workout, and Fit Bottom Girls did the same! The Arlington Connection featured Hoopnotica Master Instructor Jocelyn Gordon's class in Gateway Park. The Shreveport Times featured Laurel Richie's Hoopnotica class at Lotus Studios in Shreveport, LA. A Hoopnotica Garden was the main attraction at Hollywood hotspot, Palihouse, exclusive "Hotter Than July" events. Photos and event coverage can be found on The Daily Truffle and on Huffington Post. Joys Jam covered our National Dance Day contest with a lovely write up. Thanks for the support! WHAT'S HOT NOW Hoopnotica is offering a variety of discount packages to suit the needs of every hooper. Pick up a Start Hooping Now package for the future hooper in your life. Know an expecting mom? Give her a Preg-O Pregnancy Fitness E-Booklet. Want to give Minis a spin? Pick up our Complete Hooper package. All of our packages offer significant savings from our a-la-carte pricing! WHERE'S the HOOPER? Based on the huge success of our National Dance Day video contest, we've decided to bring another fun and challenging contest, "Where's the Hooper?" So - here's how it works: Hoopnotica has cleverly hidden the above pictured blue & black "Hooper Girl" logo throughout www.hoopnotica.com. Hooper Girl can be found on 6 separate pages of the new and improved Hoopnotica website. We won't give you any clues - you have to comb through our site to find her! The first 5 hoopers to email all six links / screenshots to pr@hoopnotica.com will win a free HOOPER tank top and Hoopnotica water bottle. We will announce the results in next month's HoopScoop. Ready, Set, GO! SHARE THE LOVE! There has never been a better time to train with us! Become a Certified Trainer, and join our team! Mark your calendars for the below Teacher Trainings. Additional dates and cities are being added regularly! Upcoming teacher Trainings • August 14th - Washington D.C. Teacher Training - get certified in our nation's capitol. (One 1 space left!) • September 11th & 12th - Rochester Teacher Training - spaces are filling up quickly! • September 25th & 26th Chicago Teacher Training - a fantastic training in a great city. • September 25th & 26th Dover, NH (Boston) Teacher Training - our newest on the books! • October 16 & 17 in Miami, FL - Miami, need we say more? • October 23& 24, Carrborro, NC Teacher Training - Check out the fantastic space Hoopdrum Flowjo HOOPER OF THE MONTH Nominate yourself or a friend to be Our Favorite Hooper! Send us a pic and your story HERE. If we choose your story, we'll send you out a beautiful Limited Edition Hoop! Name: Emily Belke Location: Wisconsin Occupation: Student at Roosevelt University (International Studies major/Poli Sci minor) Favorite Hoop: Pink & Gold travel hoop for going to the beach/park, but I can't wait to get a Malibu Dream! Favorite Song to Hoop to: "Candyman" by Christina Aguilera How She Started Hooping: An old housemate of mine was a hooper. I had no idea what the body could do with a hula hoop. After watching my housemate play with her hoops, I decided to make a few of my own and practice. I never thought I'd be able to do it since I'm not athletic, graceful, or coordinated, but I loved it too much from the start to ever give up on it. Other fun hoop facts: I try to get at least one person to try out the hoop each day. I've helped roommates, neighbors, and strangers with hooping, and it's prompted me to save up for Hoopnotica instructor training. Almost nothing can make me happier than hooping. I'm also super excited that my National Dance Day video inspired my mom to get in the hoop! Other fun hoop fact: I give all my hoops names!